Medical Devices are continually increasing in use and popularity, with the advent of so many new technologies in the healthcare space. They could pose several security and privacy risks. 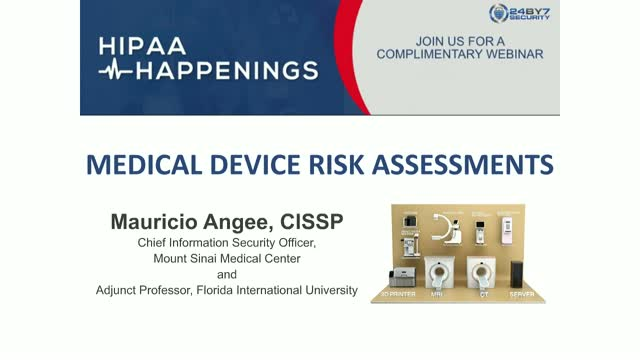 Learn from a leading hospital Chief Information Security Officer (CISO) about Medical Device Risk Assessments. CPE/ CEU Credits: You may be eligible for CEUs or CPE credits at some professional associations by attending this webinar. Please check with your professional association and its policies to see if you may apply for CEUs or CPE credits for this webinar. You can download a certificate of completion from BrightTALK after viewing the entire webinar. HIPAA requirements can be mind-boggling especially for smaller medical practices. Healthcare businesses of all sizes should comply with several requirements of HIPAA law. There are multiple components of the law involved, such as security, privacy and breach notification provisions. You may be too busy to focus only on Compliance matters, so hear from an office manager who has done this before, and learn from this office manager's perspective on HIPAA compliance. The Financial Services Industry is heavily regulated and is also a major target for cyber crime. Conducting periodic Security Risk Assessments is not only a best practice but often may be a requirement. Learn from a leading Cybersecurity expert about the process of conducting security risk assessments in the financial services industry. Rema Deo, Managing Director, 24By7Security, Inc.
We discuss key requirements related to a Vendor Risk Assessment. If you have vendors performing important duties for you and/ or have access to your or your clients' confidential information, you may need to perform a Vendor Risk Assessment. This session is part of our Cyber Conversations webinar series. - Identify the vendors that need a risk assessment. - How do you go about performing a step-by-step vendor risk assessment, sometimes also called a Third Party Risk Assessment or Third Party Information Security Assessment? CPE/ CEU Credits: You may be eligible for CEUs or CPE credits at some professional associations by attending this webinar. We will issue a Certificate of Completion to those who attend the webinar, to the specific email address and attendee name on the registration form. Please check with your professional association and its policies to see if you may apply for CEUs or CPE credits for this webinar. Sanjay Deo, President, 24By7Security, Inc.
A presentation made at the Frost & Sullivan MindXChange conference in San Diego. The theme of the conference was "The Payor and Provider Ecosystem Evolution: Collaborative Innovation in Healthcare". Part of the HIPAA Happenings webinar series from 24By7Security, this webinar features 3 well-known speakers from South Florida. Why do you need them, Examples of Business Associates, HIPAA rules governing Business Associates, what is in a BAA, Common mistakes made in BAAs. History of Cyber Insurance, The Cyber Threat Environment, Cost of a Breach, Key Insurance Coverages, Key considerations with respect to Cyber Insurance. Why Incident Response, Planning and Preparation, the SANS Incident Handling Process and it's six steps, Creating and Testing your Incident Response Plan. Complimentary HIPAA Privacy, Security and Breach Notification Training for Healthcare Covered Entities and Business Associates. Healthcare entity employees should ideally undergo HIPAA Training annually. This is a presentation made on July 17, 2018 at the FIME conference in Orlando, Florida. The theme of the conference was Medical Devices. Sanjay Deo, President of 24By7Security, Inc. talks about Ransomware and how it can impact medical devices. With engaging examples, he provides statistics and explains the pervasiveness of ransomware attacks, the impact of ransomware, myths related to ransomware attacks, and how to help mitigate the risks and protect patient data. 24By7Security is a Cybersecurity and Compliance consulting firm. The team consists of well credentialed experts in the field. Our webinars aim to educate and inform on relevant subjects in Cybersecurity and Compliance for multiple industries. We have 2 webinar series - HIPAA Happenings for healthcare, and Cyber Conversations for all industries.